Take advantage of recreation opportunities including an outdoor pool and a fitness center. This hotel also features complimentary wireless Internet access, concierge services, and babysitting/childcare (surcharge). 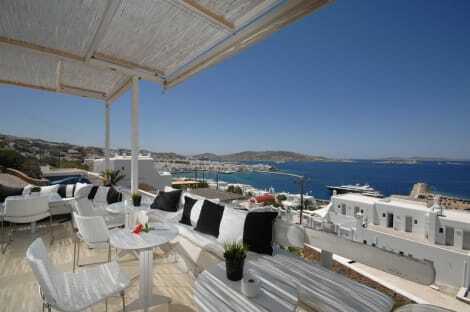 This hotel is located near the School of Fine Arts, only some 2 minutes walk from the centre of Mykonos and the port. Mykonos airport is about 2.5 km from the hotel. Renovated in 2000, this hotel is in a quiet area and affords traditional Mykonian architecture. The air-conditioned hotel features 42 rooms, safes, a bar, a TV lounge and a breakfast room. Those arriving by car may take advantage of the car park. The rooms come with an en suite bathroom, a hairdryer, a small fridge, a hire safe and a balcony or terrace. Additional fittings include a direct dial telephone and satellite/ cable TV. There is a swimming pool and poolside snack bar in the hotel grounds. Breakfast is served every morning. Perched on a hill overlooking the scenic capital of Mykonos, Little Rochari features a pool with sun terrace and a snack bar. The traditionally-built property offers air-conditioned accommodation with free Wi-Fi and a balcony with views over the Aegean Sea or the garden. Bright and airy, the air-conditioned units of Little Rochari are tastefully decorated with modern furnishings and traditional elements. Featuring tiled floors, each room and studio includes a satellite TV and a fridge.The private bathroom is stocked with a hairdryer and free toiletries. Guests can start their day with a buffet breakfast served daily at the dining area. The on-site snack bar offers an elegant setting for enjoying a night drink and a cold snack. Free laptops are provided upon request and an in-room massage treatment can be arranged. Staff at the 24-hour front desk can help with car and bicycle rental to explore the island. Little Rochari is situated 3 km from Mykonos International Airport and 1 km from Mykonos main Port. The sandy beach of Megali Ammos is at 1 km, while Platys Gialos Beach is 4 km away. Guests enjoy a free 2-way transfer from the airport.